All air conditioning units make noise when running. Older units are often louder than newer units because designs have improved over the years to reduce noise. So if your older unit seems to roar rather than purr, it’s not necessarily a sign that it is about to die on you. You may be wondering “Why is my Raleigh air conditioner so loud? or “Is my Raleigh HVAC unit running too loudly?” Air conditioners make noise because they are large machines with a lot of moving parts that work hard to keep your home at a comfortable temperature. However, if noise from your AC unit has reached new decibels, it could be the first sign of a serious issue. In an effort to help you troubleshoot the problem yourself, let us elaborate on some of the possible causes for your loud Raleigh HVAC unit. Clicking noises are normal when HVAC units turn on and off. If you hear consistently repeated clicking sounds coming from the control panel or outside compressor, a relay may be defective. An electrical control may also be causing the relay to timeout and fail. When the fan turns on in your compressor unit, it should not rattle. These sounds may be an indication of loose hardware or a failing motor. The louder the sound, the more serious the problem can be. If you hear a grinding noise, it is most likely one of the fan motors. The noise usually signals that something might be going wrong with the fan motors, such as a worn bearing. If you hear a sound from your HVAC unit that remind you of the sound playing cards make when they are attached to the spokes of bicycle tires, that is what we mean by “thwapping.” In this case, something may be stuck in the blower blades. There may also be something inside the housing that is contacting the blower while it turns. If you are hearing a very loud “metal hitting metal” type of sound, the fan blades could be hitting something, possibly a wire or tubing. This can be harmful to your fan blades and possibly the motor as well. Other maintenance issues that can cause your HVAC system to run louder than it should are bad compressor valves, bad motor, out of balance fan blades, bad reversing valve, and low refrigerant. Call us at 919-457-2494 for a service call if you are still in need of a reliable professional to properly diagnose your Raleigh HVAC unit running too loudly. We can help. We offer service all over Raleigh and the greater Triangle area and are available 24/7, 365 days a year. 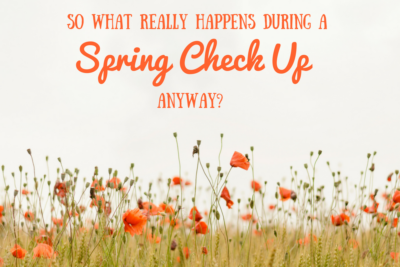 So What Really Happens During A Spring Air Conditioner Check up Anyway? Heat Pump or Furnace… What’s the Difference? We're your Raleigh Heating & Air Conditioning repair experts. Emergency AC repair Service and emergency heating repair all over Raleigh, Cary & Wake Forest. We accept all major credit cards as well as cash or checks. Please note that because we have to pay a fee for each credit card transaction, there is a 3% surcharge when paying by Credit Card.